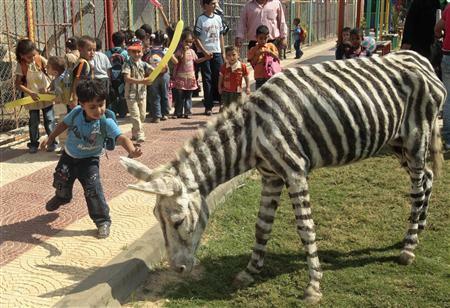 Nidal Barghouthi and the staff at the Marah Land Zoo needed new animals. There was just one little problem with that; the zoo is located in Gaza, an area of Palestine under military blockade by Israeli and Egyptian forces due to terrorist activity by Gaza’s ruling party. That makes it a little more difficult to get your hands on a zebra, which would have to be bought from somewhere in Africa and smuggled across the Egyptian border. So, to give the kids the next best thing to a zebra, Barghouthi and staff made their own zebras out of hair dye, masking tape, and two spare donkeys. I guess one hoofed, grass-eating mammal is as good as another, right? The kids seem to like them, but talk about recycling the oldest trick in the book. That cat that Pepe LePew chased after for years was always getting a skunk stripe painted on her back! When you’re stealing ideas from Chuck Jones, you’ve officially started thinking outside the box.